Fake Food Watch: The Coconut Water Fad: Hucksterism, Health Elixir or Quasi Fraud? 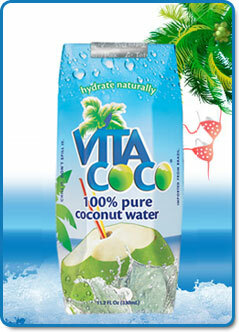 Coconut water is one of the hottest health food trends, with more than $400 million in U.S. sales in 2011. Sales have doubled each year since, 2005, according to the Wall Street Journal. Touted by Barbados-born rock-star Rihanna, endorsed by baseball superstars Josh Hamilton and Dustin Pedroia and world surfing champ Kelly Slater, invested in by film stars Demi Moore and Matthew McConaughey, TV star Kelly Ripa, and supermodel Gisele Bundchen ... the modern industrial beverage industry is banking heavily on coconut water as the next big profit-rich thing. But is coconut water the perfect-food elixir touted by its celebrity backers, or the newest blip in health food hucksterism? Or are boasts about coconut water the stuff of quasi-fraud baloney, like past food-fads acai berry and raspberry ketones? I recently bought a plethora of coconut water products and brands in cans, bottles, boxes... and my appraisal of the lot brought more questions than answers, and found more clever ambiguities and suspiciously slick marketing ploys than clear or verifiable facts. And despite adorable "cute discovery" stories on the websites of entrepreneurs of these home-grown enterprises, I uncovered deep-pocketed connections to the largest U.S. industrial beverage corporations. Connections not revealed to the consumer on lushly alluring but largely fact-free packaging or on corporate websites. What Is Genuine Coconut Water? Coconut water, in its purest, real-food form, is the clear liquid inside young, still-green coconuts, which are fruits of the coconut palm. What Is Packaged, Marketed Coconut Water? "Natural" is a legally meaningless term, that can mean anything, from bugs or sugar to dirt, dog hair, and any and all dairy products (and by-products). Two revealing VitaCoco disclosures in tiniest print on the enticing sapphire, azure, and lime box: "Produced for All Market, Inc." and "Produced in Indonesia." Fact: the FDA performs little to no testing of ingredients in imported foods. Also, since VitaCoco was produced FOR and not BY the U.S. holding corporation, the two Manhattan-based founders and their Wall Street investors can legally plead ignorance should their "coconut water" prove to be less than... well, "100% pure, never from concentrate, like sticking a straw in a coconut." Fact: Another fascinating fact VitaCoco never discloses on the website or products: a major investment by a private equity fund of Anheuser-Busch founding families, and a powerful 2010 distribution deal with the Dr. Pepper-Snapple group (Source - Crains New York). VitaCoco may camouflage its corporate connections in the look and lingo of small business coziness, but make no mistake: Vitacoco and other coconut water products are backed by U.S. industrial food corporations and Wall Street bankers. Fact: VitaCoco's products, packaging, marketing, and implied claims are no different than its top competitors, Zico ("pure premium coconut water"), which is partially owned by Coca-Cola Corp., and O.N.E., part of PepsiCo Inc.
Other coconut water products I analyzed included Pure Coconut Water ("natural isotonic hydration") and C2O Pure Coconut Water ("so pure and body balanced"). But what is the sole ingredient "natural coconut water," and how has it been processed? One commenter at a 2011 CNN story claimed "I worked for a company that manufactured coconut water products," and reported that the concoction is "frozen coconut water of miniscule amount, added coconut flavor and many additional additives. Average cost to manufacture: 47 cents." Has it been pasteurized? The FDA mandates that shelf-stable packaged beverages be pasteurized. Has coconut water, with its 24-month shelf-life, been pasteurized? If yes, why is this not noted on the label? Have sugar or salt, in any form, been added? If so, why are such taste additives not openly listed among ingredients? 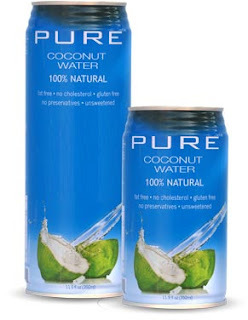 Pure Coconut Water's requisite nutrition label lists Sugar - 24g and Sodium - 80g for 17.5 fluid ounces, but only one ingredient: "natural coconut water without pulp." Huh? preservatives? With a smooth, even-hued consistency, with no emulsifiers? With a pleasing, refreshing tangy-sweet taste, with no taste additives? In beverages owned and/or distributed by Coca-Cola, PepsiCo, and Dr. Pepper-Snapple? In beverages manufactured in countries as Thailand and Indonesia, for which the US FDA does virtually no testing? Really? Extols the Pure Coconut Water website about its coconut water, "A natural isotonic beverage with an electrolyte balance that is identical to human blood—you couldn’t invent a better whole health beverage!... Get your electrolytes and athletic recovery nutrients from a single-ingredient, 100% NATURAL source." "Pure coconut water is an ideal drink if you want to hydrate your body... Drinking pure coconut water has been discovered to give benefits in the area of helping you shed unwanted pounds.... Tropical cultures know all about the weight-loss benefits, as well as other benefits of pure coconut water, because they have been using it for centuries. Hucksterism at its American finest? Possible quasi-fraud baloney, like past food-fads acai berry and raspberry ketones? Too many unanswered, common sense questions. Too many potentially undisclosed facts about this celebrity-hyped craze..
Too many seeming far-fetched claims. Too much profit at stake for major U.S. industrial food corporations. As for me and my husband, we plan to save our hard-earned wages and, instead, drink water, unadorned, to meet our hydration needs. After all, there is no hydration difference between water and pricey, packaged coconut waters per a 2012 scientific study by the Journal of the International Society of Sports Nutrition. I've been reading and enjoying your blog (I recently RSS'd it, and have gone back and read a lot of the older posts.) Thanks for all of your hard work and for bringing to light some very important issues in the food business. I only had one small comment. In general I get the impression that this page is very well researched and fact-based. It doesn't seem like an anti-corporate blog, or as if its founded in a particular ideology and that the facts you present are biased towards that ideology. There was a small piece today that seemed a little out of place, and that seemed to go slightly beyond pointing out misleading advertising: "Vitacoco and other coconut water products in U.S. markets are just another source of mega-profits for industrial food corporations, Wall Street bankers and their ilk." While I may share some of the ideology that may have led to the phrasing of this comment, I don't think it's relevant to the quality of the food here or the truth of the advertising. It's certainly important for me to know that a drink which claims to have been a new discovery and a self-started business is actually funded or linked to major corporations. However, it's not important to me to know about the mega-profits of those corporations, and it's not relevant to consider "wall street bankers" when assessing the truth or quality of the food product. Adding "and their ilk" makes it further seem like a screed against the "haves" rather than an analysis of product labeling. Anyway, just sharing my opinion. I hate to be a part of the phenomenon that people rarely comment to express their enjoyment of something, but are quick to inform others when something falls short of their expectations, but there you are. Drew, thank you for your comment! After much thought, I agree with you: that sentence WAS gratuitous om my part. I desire for readers to draw their own conclusions based on the facts, and have thus removed those words. Again, thanks! I just found your blog while looking for hydrogenated oil in frosting and I am so thankful for your time and research! Following the comment thread for this post, I think it is important to be aware and the money behind the product. I appreciate you pointing out the motive! I will continue to follow this blog and sharing your posts with my friends! Thank you, Mikel, for your kind words. If u guys need pure coconut water dont buy in a can or bottle..just buy d whole coconut n poke a hole in it n drink it..
Deborah, I encourage you to go find a bottle of Harmless Harvest Coconut Water. It is the only actually raw, non-processed and non-corporately-owned/influenced coconut water for sale that I have found. And it actually tastes like it came straight out of a coconut... because it did. Definitely a good hangover cure. I dig that. Coconut water is absolutely amazing. It is a nice and healthy drink. I hope it is not very costly. It IS expensive and hyped. Ridiculously so, considering how much you get for what you're paying. Gatorade is cheaper and no less beneficial to you---only without the hype. It's just another fad that will pass in a year or so.